Mommy Jane always believe that a school uniform teaches students to dress smartly and take pride in their appearance. 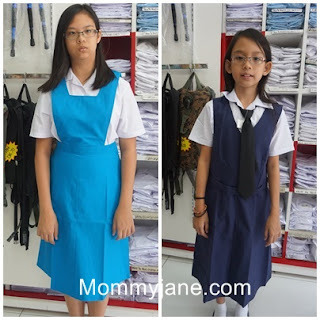 Since my 5 Little Angels need wear their school uniforms daily from Monday to Friday except for public holidays or school holidays or any other holidays or during sports day from 6.30 a.m. till 3.30 p.m., Mommy Jane will always choose the best quality of school uniforms for their comfort and appearance. 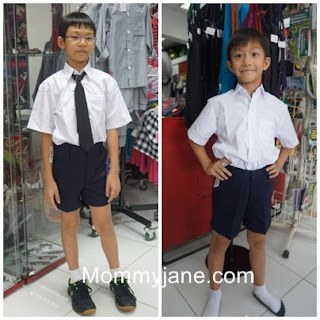 This year, Mommy Jane had shopped for their school uniforms early to avoid lack of size and before the price increase due to the demand when school re-open on January next round. I'm sure many parents like me love last minute shopping too but it will be congested and no more size that our Little Ones need to wear comfortably. Last Saturday, Mommy Jane brought Little Angels to PJ Uniform Sdn Bhd which carries the trade name of "Professor" to get their new school uniforms early for next year schooling. Professor was established in 1982 with its first outlet located in SS2, Petaling Jaya. Currently, they had 12 outlets within Klang Valley. First time to SS2 outlet, Mommy Jane was impressed with the most comprehensive range of school and extra curriculum activities uniform and accessories that were available. Professor Red Label school uniform is their main label since 19820 They had emphasized on using only A grade material for their products. By having their own factory, it also guarantees their high expectation in excellent workmanship in every piece of uniform. Thus, making their uniforms more durable than others. For children who are a bit large in sizes, no worries anymore coz' Professor is also the pioneers in providing extra large size uniform. In 2008, Professor had introduces the "zipped" pocket in the uniforms which is an extra feature in preventing the loss of monies while our Little Ones engage in their active lifestyle. A good news for my Little Angels and me especially my Little Angels will always lost their money in school. Sometimes, the money drop somewhere and end up, they don't have money to buy for their lunch. Everytime they came back eating more than usual, when I ask, then only they will reveal that the money drop from their pocket and they couldn't find it anymore. With the zipped pocket, no more worries on lost of monies. In 2013, Professor Green Label school uniform was created to caters the demands of cheaper uniform without compromising on the workmanship synonymous to their brand. For parents who are budget conscious, we can opt for this range and rest be assured that our children are getting the quality and durable uniform that we deserve. Apart from school uniform, Professor also offer a wide selection of camping equipment and related accessories such as tents, sleeping bags, torches, knives, outdoor bags, trekking poles, camping cooking wares and binoculars. The success in Professor brand lies in their consistent delivery of quality products that continuously meet our expectation. Hence, the name "Professor" is now synonymous with excellent, comfortable, durable and quality uniform. Their mission is to continuously be the One-Stop shop for all the school and outdoor related needs all year long. For more information, do visit their website at www.professoruniforms.com or follow their facebook page at www.facebook.om/ProfessorUniforms. You can check out the store near you at www.professoruniforms.com/locations. When my eldest Angel, CM went to standard one, with no experience, I had bought her school uniforms from just about everyone who offers but the bottom line with these clothes is that you get what you pay for. After just one or two washes, I start to get really frustrated with what I had bought from these stores. The khaki material shrinks and looks wrinkled and misshapen after just few washes. Since then, I started to bought those quality uniforms to them coz' I believe I actually saving money and energy in the long run. This year, I was introduced to Professor School Uniform. I was impressed with the quality of the material used. Even after washing it, it is wrinkle-free and easier to iron it. A customer that I saw that day at the outlet said that her son also wore Professor School Uniform for years and she still getting it now coz' the white colour shirt never pill or fade or even yellowish after few months of washing. It is a good news to us as a parent to ensure our Little Ones will always wear smart and clean. For my Little Angels wear, I buy everything for them a size up so that we can just adjust the fit to our Little Ones as he or she grows but make sure those pants stay up. It could last them a year or two or handling down to a younger sibling with the quality of the school uniform provided by the Professor brand. With the additional feature of the inner pocket, Mommy Jane was completely satisfied with their A grade material used for the white shirt, pinafore and the pants. Professor School Uniforms truly suitable for girls and boys both in primary and secondary school for their comfort and for Mommy Jane to save money and energy to iron their uniforms daily. Nanie, agreed with you. I love their quality too and it is really comfortable wearing it. Ivy, wearing new uniforms are our best moments but nowadays not really for kids. They just too lucky now. Getting all the school items ready as early as possible is a good way to cultivate no last miniute rush. Kelly, that's the reason I got it now instead. To avoid rushing with a bunch of peoples with long queue. My parents did that to me on 'back to school' fair during schooling time, ahh..memories! Mable, sweet memory right ? I miss that too. I trust this brand as they provide a good quality of uniform. Betty, indeed they are. Can last for few years and in long run, we actually save a lot. Yana, once we got the best place to shop for the uniforms, normally we stick to it to save times and for the sake of quality. They uniforms are good quality. My friends and colleagues also their supporters. Rane, my friends bought their children uniforms there too. Professor is a trusted brand. Miera, I'm sure your daughter will love the uniforms too. Get her uniform early to avoid last minute shopping. Miera..Guitar brand from KimNovak is just as good as Professor. I have bought both types for my Angel. Aghhh~ I miss my school uniform! Last time my school uniform is all custom made one. Shini, your parents must be very rich to get a custom made for you but at least I'm sure it will suited on you well. Thanks for your recommendation, my Malaysian friends is also looking for uniform supplier, luckily I passed by here. Blair, you're most welcome. Hope they enjoyed the quality of the uniforms too. wao! this post make me miss my secondary school moment ! May, times flies and the moment will always the best. Elana, indeed they are. They had tried out the uniforms there for almost an hour. They are really excited. This place has been around for awhile now and gosh looking back, I really miss those days where we had to wear uniforms :) Great quality too. Shrivani, they had been operated since 1982 and now they had expand to 12 outlets. With the trust from the buyers, their business had grown now.